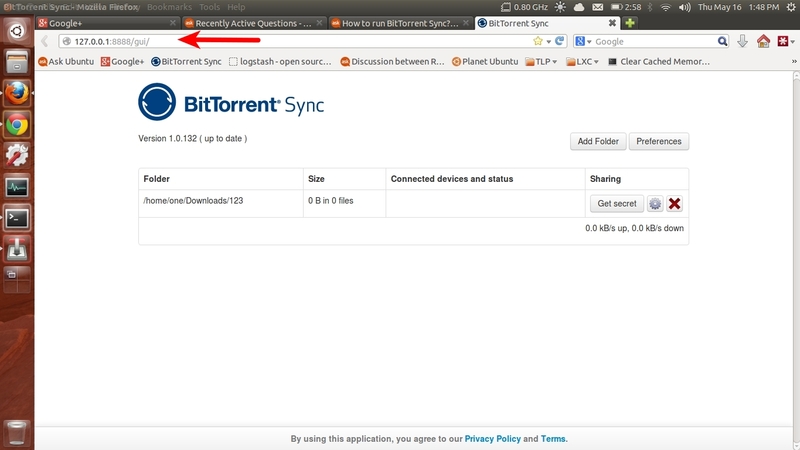 How to run BitTorrent Sync? I am in Ubuntu 12.04 (precise) 64bit and downloaded the btsync executable from http://labs.bittorrent.com/experiments/sync/ but running it doesn't seem to have any effect. Double-clicking the executable does nothing, and running ./btsync in the terminal also exits immediately without any output. Has anyone successfully ran this under Ubuntu, and if so, is there any special configuration changes that need to be made to make it work? According to the user guide (pdf), there is (at least for now) no native GUI for Linux. The graphical interface for Linux is browser-based, and can be accessed at http://localhost:8888/gui/. As of June 2017 Sync (now owned by Resilio) now provides repositories for many major Linux operating systems, including Ubuntu, Debian, Centos, Red Hat, Fedora, etc. Install instructions are here, and copied below for Ubuntu. There's a guide on how to use Sync with Linux here. The page I linked to goes into how to start it and how to have it start automatically. As of February 18, 2016, there are official Ubuntu/Debian packages. The instructions below are adapted from the blog's announcement post. It is advised to remove any other 3rd party bt-sync related repositories from /etc/apt/sources.list.d first. Note, that when you install Sync package it is going to add btsync user to your Linux and run under btsync user. Take care of permissions and groups before you start syncing. Unfortunately, this option is not available for 14.10 or earlier. I know I am not spelling out the instructions from the blog post here. But it ultimately was more useful to me so wanted to share. BitTorrent Sync's unofficial PPA now has a package btsync-gui, which adds GTK GUI (in addition to WebUI). There's a thread about the GUI on btsync's forum. Not the answer you're looking for? Browse other questions tagged bittorrent or ask your own question. Where to install a program? How to Handle BTsync GUI in Ubuntu 14.04 with Small Displays? How to access to synchronized folders via BitTorrent Sync? How do I get Bittorrent Sync to run automatically after a reboot? How do I stop BitTorrent Sync (Resilio) service?